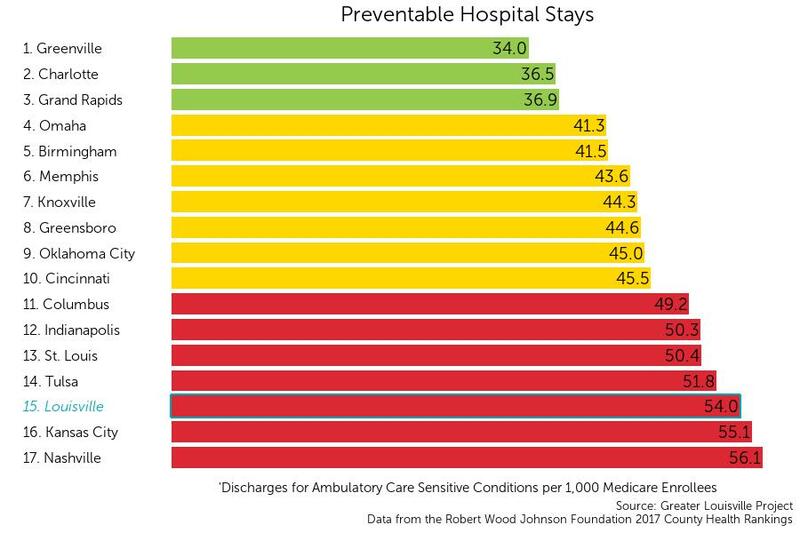 Preventable hospital stays are a proxy for understanding the role and impact of the available community healthcare network. Ambulatory care sensitive conditions include conditions such as convulsions, COPD, pneumonia, asthma, and diabetes. This measure is used to assess how often people use hospitals for such conditions instead of primary care providers, indicating the accessibility of care for individuals. This measure uses Medicare data, focusing on individuals aged 65 and older, which means that it will not be reflective of hospital stays for younger generations. Louisville currently ranks 15th among its peer cities in age-adjusted discharges for ambulatory care sensitive conditions per 1,000 medicare enrollees with 54 per 1,000. On this metric, Louisville ranks among the bottom tier of its peer group according to a natural breaks algorithm. Cities in green are those that outperform their peers, cities in yellow represent the middle cluster, and those in red are a group that lags behind its peers on this indicator.